After leaving school at the age of 14. 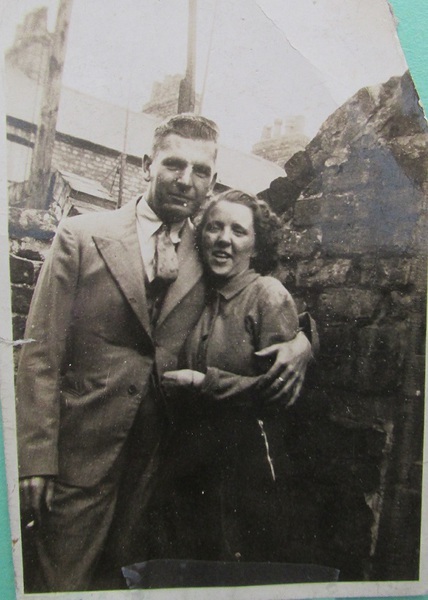 My father served an apprenticeship as a painter and decorator with Winstanly a Wallasey company. At the time this occupation was regarded as a highly skilled trade. He would be responsible for mixing the paint with pigments, oils, and driers. I remember all of the doors in our house had been expertly painted with a fine brush to depict the grain of the wood. We probably had the best decorated terraced house in Field Road. My father always took a pride in this appearance. Back row on left my father Alfred Dutton, standing far right Tommy Dutton my father's Brother. Left on Middle row Mr. Ball from Busby Cottages off Field Road. 1. 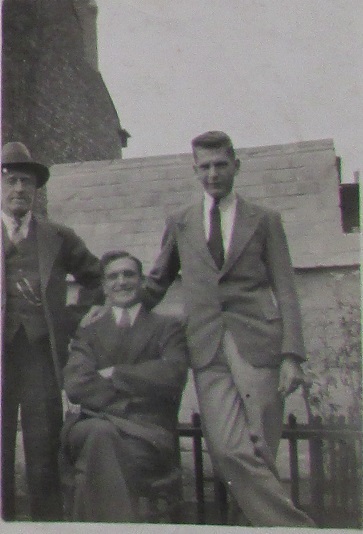 Thomas Dutton with Hat, John Dean seated and my father as a young man. 2. 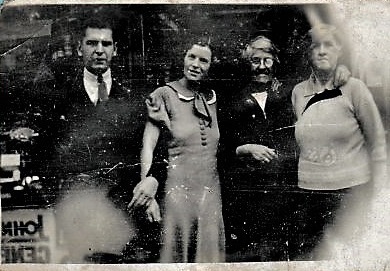 From L to R My Father Alfred, Aunt Polly, Ivy Dean. Together with an old friend who was over 100 years old. 3. Dad with Alice in Field Road Yard. 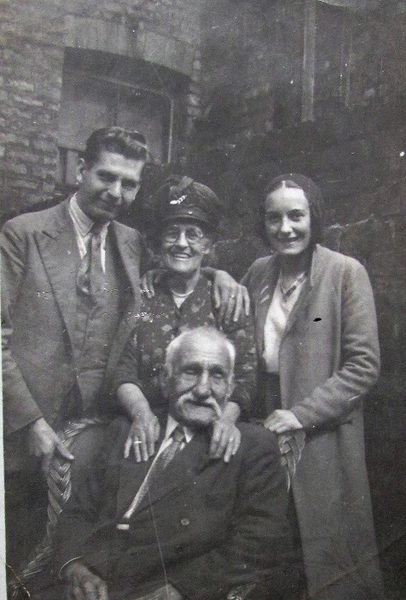 4.From L t R Alfred R. Dutton (My Father),Dorothy Dutton (my Mother), Mary Dutton (Aunt Polly), and Shara Dutton. Aunt Polly brought my father up in Merton Road, Liscard. The photograph was taken in Birmingham ehere Aunt Shara lived. 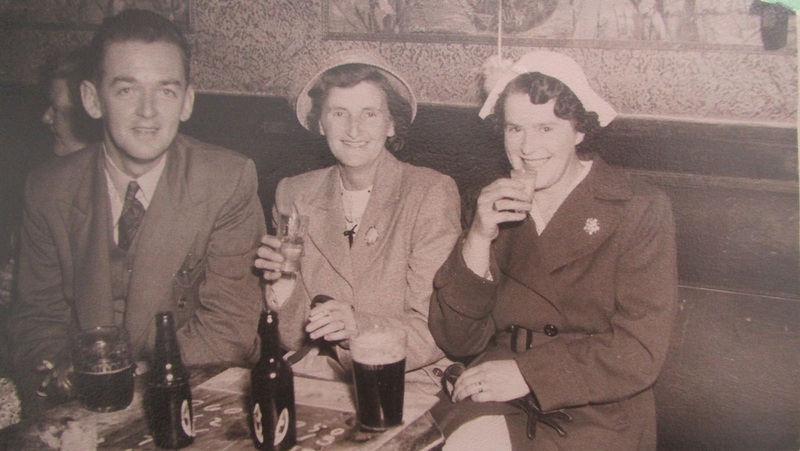 5.Norman Evans, Nan Evans, Dorothy Dutton photograph taken in the Travellers Rest New Brighton. Alfred, my dad had just gone to buy some cigarettes so is missing from the photo.